Written by CMOS Bulletin SCMO on February 2, 2018 . Posted in Air Quality, Atmosphere, What's Current. It’s 1987 and I have just bought my first personal computer – an IBM PC clone running at a stunning 8MHz! I’m also on sabbatical at the National Center for Atmospheric Research (NCAR) in Boulder, Colorado, when one of those cafeteria conversations start with John Gille who asks: “You can measure composition in the stratosphere with correlation radiometers, could you do it for the troposphere?”. Being on sabbatical it seemed like an interesting problem to look at, so I worked on it and wrote a short paper on an instrument known as the “Length Modulated Correlation Radiometer”, which had the properties needed for such measurements. Little did I know that this would be the beginning of a thirty-year saga that has engaged my attention for much of my career. In 1988, an International Announcement of Opportunity came out from NASA for the Earth Observing System and a series of Polar Orbiting Platforms that would monitor the state of the planet over a fifteen-year time frame with three successive copies of each instrument involved. These instruments were to be mounted on enormous, school bus size, Polar Orbiting Platforms (POP). 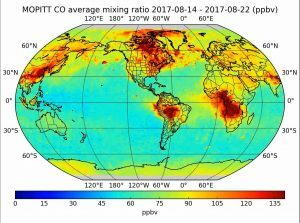 With a bit of encouragement we brought together an international science team and proposed, along with over 100 other proposals from around the world, an instrument that we dubbed MOPITT for “Measurements Of Pollution In The Troposphere” to measure carbon monoxide in the lower atmosphere (troposphere) over the entire planet. We always aimed to get around to choosing a better acronym, but we never did. Why did we choose carbon monoxide as our target gas? There are three reasons. The first is that carbon monoxide is an important lower atmosphere (tropospheric) pollutant produced largely by incomplete combustion, both natural and anthropogenic. The second reason is that it participates in atmospheric chemistry, so measuring it gives us a window into lower atmospheric chemistry. The third reason is that it has a lifetime of about a month in the atmosphere, and so is transported on a regional to global scale thus allowing us to monitor the spread of pollution. Our application for the MOPITT instrument was supported by the Space Division of the National Research Council of Canada, and to our immense satisfaction it was chosen to move forward into the next phase of development. Our contractors were COMDEV of Cambridge, Ontario and the design proceeded. As with most space instruments, this one involved a lot of new technology and so was very difficult for the industry and academic teams to bring it from the concept stage to something that might be realised in hardware. We were using cooled detectors with a mechanical Stirling Cycle Cooler and the Length Modulated Radiometer, which was all new technology. We had to produce an instrument that would last at least five years in orbit and meet a myriad of requirements from the spacecraft. In parallel with this hardware activity, NASA supported our partners at NCAR to develop the data processing and retrieval software. The Earth Observing System was also undergoing changes due to changing priorities and budget constraints at NASA. After many iterations and down-scaling MOPITT survived as an instrument on the first of three smaller platforms, which became known as Terra, Aqua and Aura. Each of these smaller platforms was “only” the size of a small school bus. In Canada the Canadian Space Agency (CSA) was formed, and the MOPITT project transitioned there. Test facilities were built at the University of Toronto and by 1996 the instrument was mostly completed and ready to undergo testing. 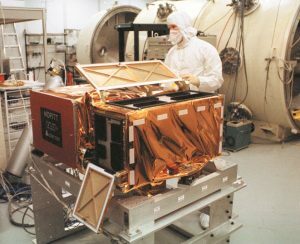 First in Canada, and then when integrated onto the Terra spacecraft at Valley Forge, Pennsylvania, the MOPITT instrument underwent a gruelling test schedule and was finally ready for launch in 1999. Remember Y2K? There was a lot of nervousness around technical projects at that time and the Terra launch was scheduled for late December 1999 from Vandenberg Test Range in California. We all went down for the launch on December 17th, but a procedure problem meant the launch had to be aborted. We had a last attempt on December 18th. Failure to launch then would mean waiting until after the New Year to avoid any Y2K problems. Seconds before the end of the launch window at 18:57:39 UTC, Terra launched, and I watched much of my career flying towards the heavens on a very large rocket. Even then boosting the spacecraft to final orbit was delayed until after Y2K. We made it into the final orbit and started analysing the measurements. Our first attempts involved showing that carbon monoxide was “high” or “low” in various places but things rapidly improved, and after a year the instrument seemed to be working well. Almost immediately we realised that carbon monoxide was a global phenomenon, not just a local or regional one, and that global focus has stayed with the mission ever since then. No one likes getting phone calls in the middle of the night, but the one that says, “your instrument is showing an anomaly” is definitely not welcome. On May 7th 2001 that was what happened. Half of our cooling system had failed, and it looked as though the mission was over. But a lot of people did a lot of hard work and found that if we reconfigured the cooling system a bit we could get half the instrument working again, and if we reconfigured the operational part of the instrument we could still get pretty well all of the science. So, after a lot of testing and review, we re-activated the instrument several months later on August 23rd and it has been operating in that mode ever since. Five years came and went, then ten years, then fifteen years, and we – especially the NCAR team – have gotten better and better at interpreting the data from the instrument. A NASA employee reminded me recently that our original objective was a fifteen-year dataset, which we had now achieved with only a single instrument instead of the three copies originally envisaged. On December 18th 2017, we passed 18 years from launch, and we now have an 18 year data record of carbon monoxide over the planet. The NCAR team have taken the analysis software to version 7. The whole Terra mission has been a great success. A recent review stated that Terra’s impact on progress in many earth science disciplines has been staggering …. Several subcommittee members convincingly argued that Terra is perhaps the single most important NASA Earth Science Mission ever. (NASA, 2017) There are now over 400 scientific papers referencing MOPITT data from over 250 institutions in over 40 countries. MOPITT data have been used to estimate surface emissions, measure trends and with carbon dioxide measurements have extended our understanding of the carbon cycle. We have made over 1.3 billion measurements and in October 2018 the spacecraft will complete 100,000 orbits of the planet. This causes a little problem, because the data specifications only allow 5 digits for the orbit number! Where will it end? Assuming no catastrophic failures, the spacecraft will run out of the fuel needed to maintain its precision orbit in the early 2020s, but after that it can fly ballistic for several decades. How long will MOPITT last? The limit will be the longevity of the sample gases we carry in the radiometer cells. Although these sample gases are slowly disappearing, we should be good for at least another decade or two. So, after thirty years, the echo of that cafeteria conversation is still with me, and I suppose I am now in a position to answer the question: Yes, John, we can do these measurements in the troposphere. Prof. James R. Drummond, M.A., D.Phil. 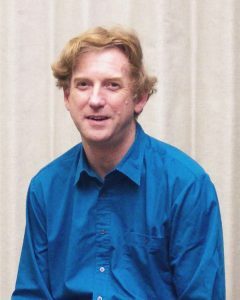 FRSC graduated from the University of Oxford in England, was a faculty member of the Department of Physics, Toronto University for 27 years and then a Canada Research Chair in Remote Sounding of Atmospheres in the Department of Physics and Atmospheric Science at Dalhousie University until his recent “retirement”. He is the currently the Principal Investigator for the Measurements Of Pollution in The Troposphere (MOPITT) instrument on the Terra satellite; a Co-Investigator for the instruments on the Canadian SciSat satellite; Principal Investigator of the Polar Environment Atmospheric Research Laboratory (PEARL) at Eureka, Nunavut; the founding president of the Canadian Network of Northern Research Operators (CNNRO); the Chair of the Forum of Arctic Research Operators (FARO); and the Canadian representative to several international organisations.